Back when I was playing (and loving) Homeworld , I would occasionally zoom in to the faux-cockpit view of a fighter and enjoy the scenery as it slashed through convoys of capital ships. It was an exciting perspective, even though the ships weren't directly controllable, which is why I'm so very much looking forward to Enemy Starfighter . As the newest trailer shows, it's the same kind of visual vibe, but now you actually get to fly. Star Citizen and Elite: Dangerous both look fantastic, but there's something about the simpler, more colorful style of Enemy Starfighter that really yanks my stick. Even better: the new trailer boasts that the game will support virtual reality. 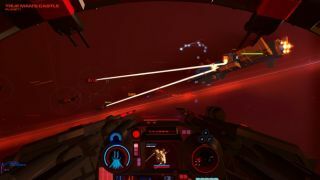 I don't care that the Homeworld connection is almost certainly entirely superficial; this may well be the game that forces me to spring for an Oculus Rift. Enemy Starfighter will be playable at the upcoming PAX Prime, running from August 29 to September 1, where our crack PC Gamer editorial team will hopefully get to spend some time with it. In the meantime, feel free to dig a little deeper into the game by way of this hands-on preview from earlier this summer. No release date has been set but creator Mike Tipul said he hopes to have something up on Early Access later this summer.